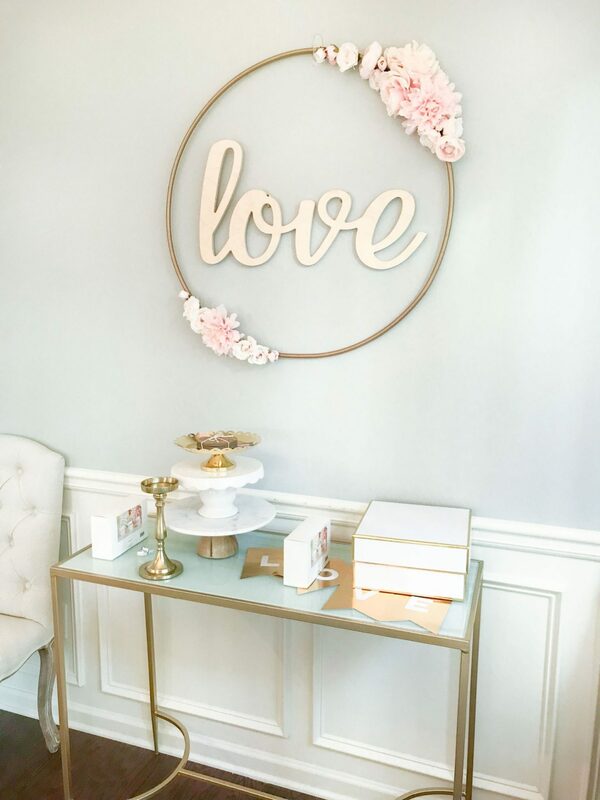 Here is how to make this DIY hula hoop love sign. 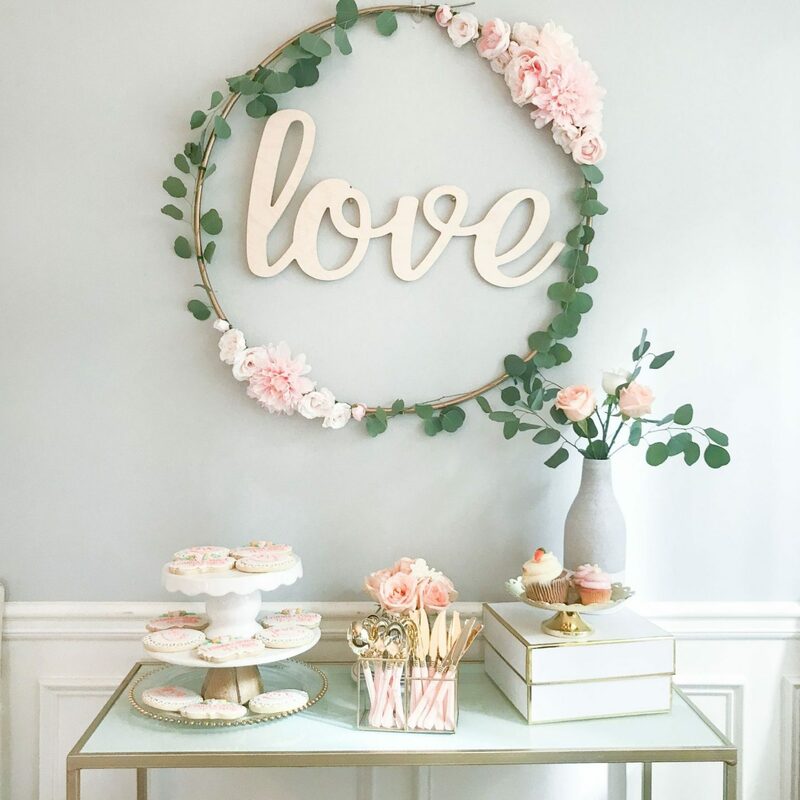 I came across a post from Style Me Pretty showing a hula hoop ribbon photo display and wanted to recreate one myself for a bridal shower I was hosting. Let me tell you, this was the easiest DIY and completely made the display at the party! You can see the full bridal shower here for more inspiration. I decided not to do the photos in the original tutorial to make it more of a backdrop, but you can get creative with the center based on the party you’re hosting or the decorative spot you’re using it for. Here are the steps to recreate it yourself! Head here next to see how a video on how I put the entire bridal shower together! I pulled the florals from the stems and played with the arrangement on the hula hoop. I added the biggest florals in the center and trickled out to smaller buds. I used a different amount on the other side so it wasn’t perfectly symmetrical. I recommend purchasing bushes of florals verse individual stems to save money and they easily pop off the stems. I purchased all of mine from Michaels, along with the wood cut out LOVE sign I used in the center. 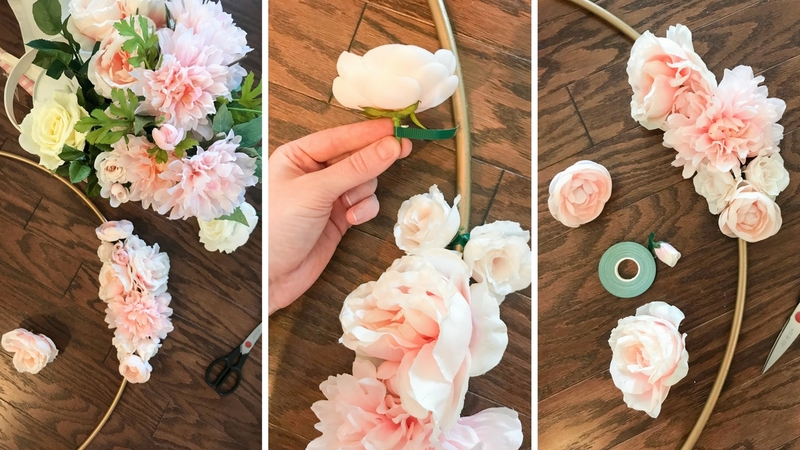 Cut strips of floral tape and wrap the base of the floral around the hula hoop. You will definitely need scissors to cut this tape! I made sure to hide the tape behind the flowers. Feel free to use real flowers if your heart desires… I definitely didn’t have the time the morning of to make it fresh. It didn’t seem finished with just the florals, so I used the floral tape to trickle fresh silver dollar eucalyptus around the hoop. Make sure to tape in areas where the leaves will hide it if you can! I decided to keep the natural wood of the love sign but feel free to paint it if you’d like. I contemplated applying marble contact paper to the sign, but I didn’t think the amount of time for that project would be worth it or necessary. FYI I put the greenery on the day of the shower to keep it fresh in water as long as possible. Here is a quick video of the process! Not the best angles.. but hopefully you find it helpful! Thanks for reading! You can see all the details from the bridal shower in this post. 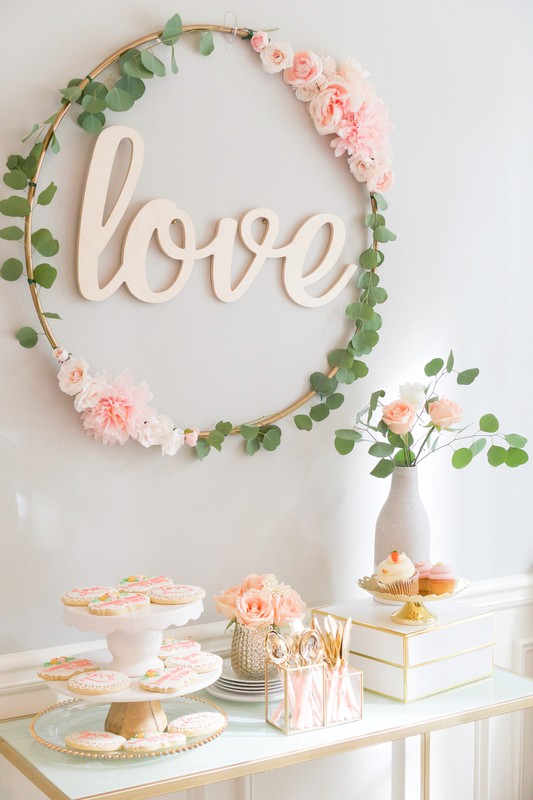 Also check out my bridal shower for more inspiration for your next party! Disregard my question. I just found your resourse comment. Thx! What is the size of the hula hoop purchased? What size is this hula hoop? I want to put it above a fireplace but I don’t think the homeowner will want me to use tape or hooks. Any ideas on how to stand it up on the mantel or do think it would lean against the wall just fine? What do you plan on putting in the center of the hoop?? You can always try leaning it and adding tape or something to keep the base of the hula hoop from sliding forward. I am having trouble with the floral tape. It isn’t sticking to the flowers or hoola hoop. I even went out and purchased a different kind. Do you have any tips for this part? I’m getting pretty frustrated. Oh no! I used strips long enough to wrap around the hoop twice. If I could, I would cross the direction on the second loop. If you’re wanting it to be permanent, you can use hot glue! I used the tape so I could take it down easily afterward. 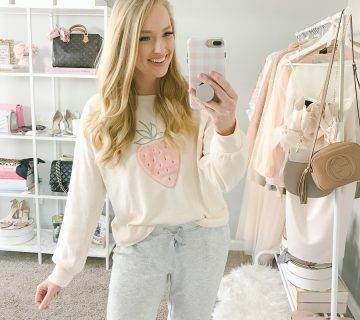 I just came across this site and want to purchase the love sign but micheals no longer have them in stock. It says it’s 28”. Is that the total length? I’m trying to find something similar on Etsy and would like detail (height & length) dimensions so it’s not too big or small for the 30in hoop. Thanks in advance!! Yes it’s 28 inches, I hope you find something similar! This is really pretty and it seems easy to do. So many DIY ideas turn into such time consuming projects. For those who can’t find the love sign, you can have any print on demand laser cutter cut (like Ponoko) and they will cut and ship it to you. They are relatively inexpensive to make and that way you can you any font you’d like for the sign. Where did you get your silver dollar eucalyptus? All I see are the varieties where the leaves are very close to each other, unlike the ones you used. I picked up fresh silver dollar eucalyptus at a local floral shop! What size hula hoop and love sign did u use?! How long did the eucalyptus stay nice looking? Days or weeks? I think it just stayed vibrant green for the day but I love the look of darker eucalyptus too! I kept it out on display for over a week.